The significance of a website seized by law enforcement is heightened in light of the controversial SOPA and PIPA legislation currently being considered in Congress. Given the high stakes—the open exchange of information in a free society, government interference with the Internet—I feel compelled to let the people at the FBI know what I think. Where have I seen a better looking image? I mean, other than every movie ever made that shows a computer screen? I don’t even know where to start. Fine, the seals. Any one of these seals by itself is like starting the drive from your own five-yard line. The three together is handing the ball to the other team and carrying them into the end zone. You’re not into football metaphors? OK, a seal crammed full of text like “National Intellectual Rights Coordination Center” is the design equivalent of dividing by zero. All three is taking the limit of bad design as it approaches zero and it evaluates to negative infinity. Math isn’t your thing? No sweat—what I said doesn’t make sense anyway. The point is, the seals are ugly. But they’re your logos, you say? I feel badly saying this, but they look like someone just slapped them together at 4PM on Friday after a lunchtime happy hour. Take the right one. It says, “Protection is our trademark.” I’m not a IP genius, but it seems to me like if protection really is your trademark, and you want people to take it seriously, you need to use that symbol. Like “Protection is our trademark™” or maybe “PROTECTION™”. But since you’re not actually selling anything or engaging in trade, maybe it would be more accurate to say that protection is your service mark. You don’t see that little SM enough. As if the seals weren’t texty enough already, someone put “FBI ANTI-PIRACY WARNING” on top of the middle one. Is that part of the seal? Operating under the dubious assumption that there’s any design merit to this logo in the first place, the last thing you want to do is cover up your logo. Can you imagine Nike labeling clothes with its swoosh but then covering half of it up with “GARMENT CARE INSTRUCTIONS”? Who picked the color scheme for the background? Had this person eaten a hot dog recently? That’s the only way I can figure it out. You can’t even read the complete word “seized” once in this tiled background. The cited list of alleged crimes at the bottom is a nice touch, but, guys, what are we doing with the typography here? A big block of bold, italic, centered text. I read the first line and I think, “This is heavy stuff—they’re being changed with Conspiracy to Commit” and then I get confused until I realize that it’s Conspiracy to Commit … Copyright Infringement (18 U.S.C. § 371). I know how to continue reading on the next line, but you’re taking some serious liberties with awkward line breaks. What we need to focus on is what a colossal missed opportunity this is for you. 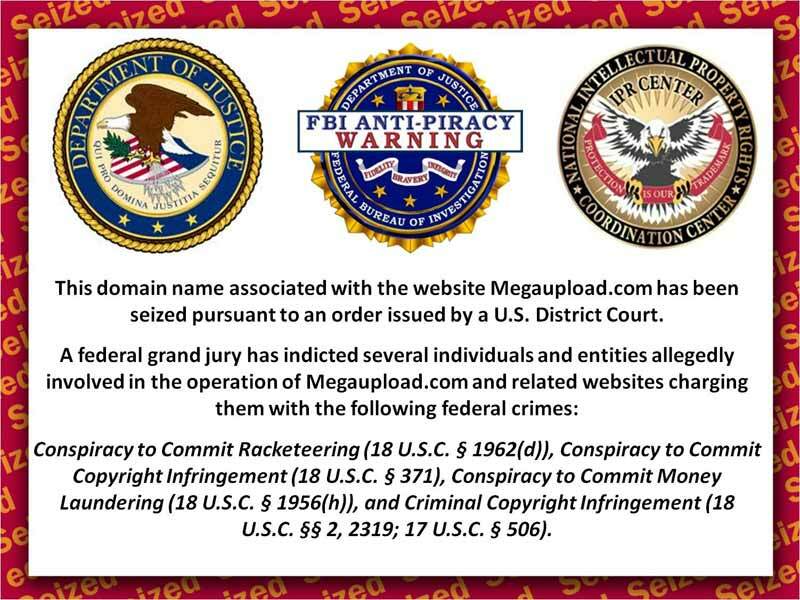 MegaUpload is down and the notice on the site is getting tons of exposure and when you go there it’s like you’re stuck watching the beginning of a movie forever, or at least that’s what it seems like for those people who paid for the movie and have to watch the FBI reminder to pay for the movie. The user goes to MegaUpload. The site looks normal. Suddenly, the eagles from your logos swoop in and the cool one with the arrows in its feet starts attacking the site while the other one hangs a banner over it that says “Seized by the FBI” and then jail bars drop down over the entire site. The user goes to MegaUpload. The screen is filled with static like an old television. Then it looks like the screen is flipping through different TV channels. They’re all static. Finally, you get to a channel with a retro-looking message: “Seized by the FBI”. The retro part here probably plays to your design strengths. The user goes to MegaUpload. The site is covered with sheets of brushed aluminum that look very heavy duty. Etched into the aluminum is the message: “Seized by the FBI”. The user goes to MegaUpload. It says “HTTP Error 460” (this doesn’t exist—you would be making it up): “Seized by the FBI”. The user goes to MegaUpload. A video of Rick Astley singing “Never Going To Give You Up” starts playing. When the video finishes, it fades out and is replaced by the text “Seized by the FBI”. There are probably jQuery plugins that do all these effects already and you could use those as framework to build on. So dust off your copy of Photoshop. Use the mosaic filter. Add some lens flares. Watch Sneakers and Hackers and The Net and The Matrix and Tron and WarGames. Stay away from Papyrus. Then go and take down MegaUpload and put up something amazing. This is your moment: seize it. For where your treasure is, there too your heart will be.